Spring 2018 EDGE Newsletter - Register to Receive Your FREE Copy! 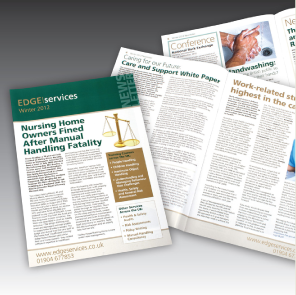 Now in its 13th year of production, the EDGE free quarterly newsletter is full of useful care industry news and updates. From the ‘Need to Know’ feature to details on legal cases, conference information and reviews and current affairs, the newsletter has proven itself a extremely useful resource to our clients and to staff working within the health care and social care industries. So that our subscribers can benefit from having the EDGE Newsletter hot off the press and at their fingertips, the Spring 2018 edition will be the last hard, paper copy. To ensure that you receive all future e-editions, please visit www.edgeservices.co.uk and click on the NEWS tab to subscribe – don’t miss out!